Terrain description Sumas Mountain is a 900 metre high forested hill, located directly by the TransCanada Hwy1 between Abbotsford and Chilliwack. 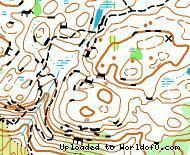 The brand new orienteering map covers the upper portion of the hill, extending from around 650 metres elevation to the top. The area is dominated by extraordinary old-growth forest with open and fast running, as you can see in the video and photos on this website. There are plenty of rich contour and rock features, as well as some very steep slopes. To avoid excessive climb on the courses, they will start high and finish low on the hill. Holiday activities,nature,hiking etc. There are many hiking opportunities in the nearby West Coast Mountains. Also, the 2010 Olympic city of Vancouver is 100km from the competition area.